This section of the College Autism Network website presents two distinct sets of training-related resources. Fast Fact #9 Mentoring can be more than academic. 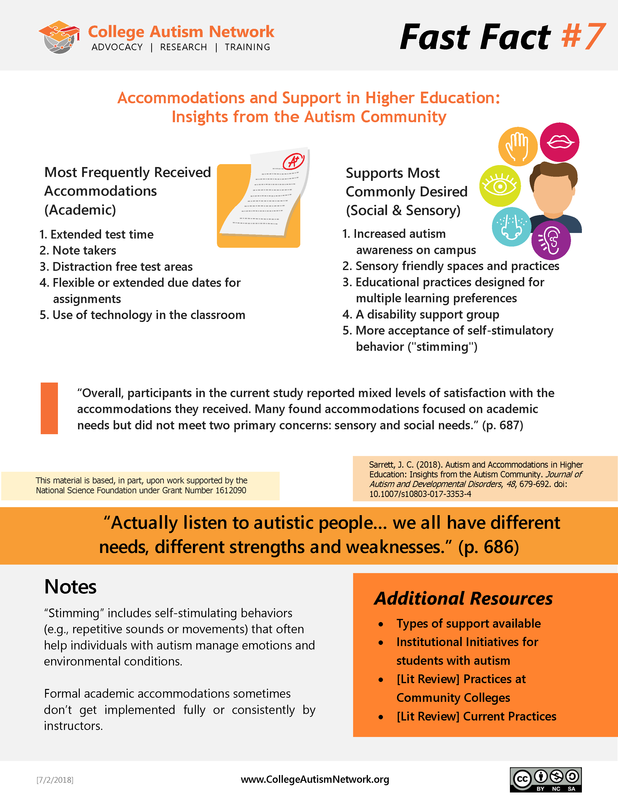 Typical accommodations for students with autism in higher education focus on academic issues. 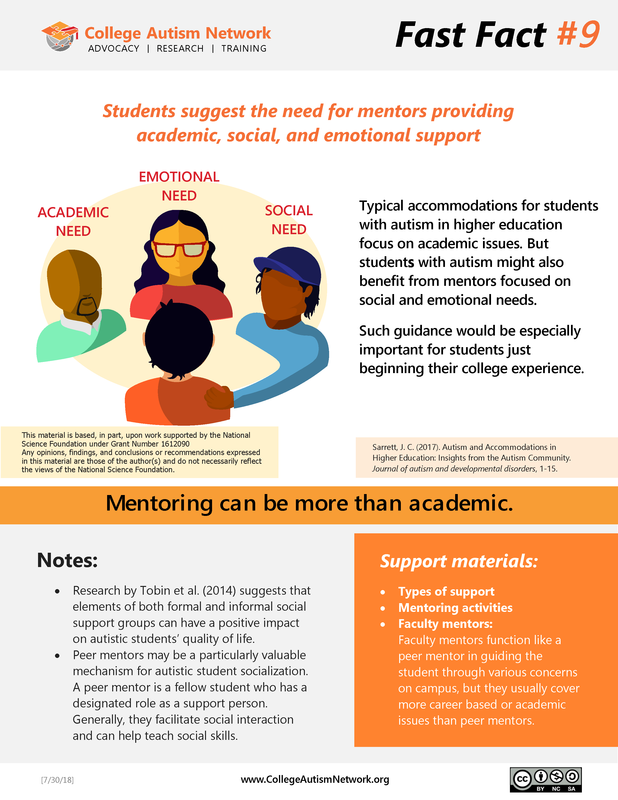 But students with autism might also benefit from mentors focused on social and emotional needs. Such guidance would be especially important for students just beginning their college experience. Fast Fact #8 Why don’t accommodations always work? 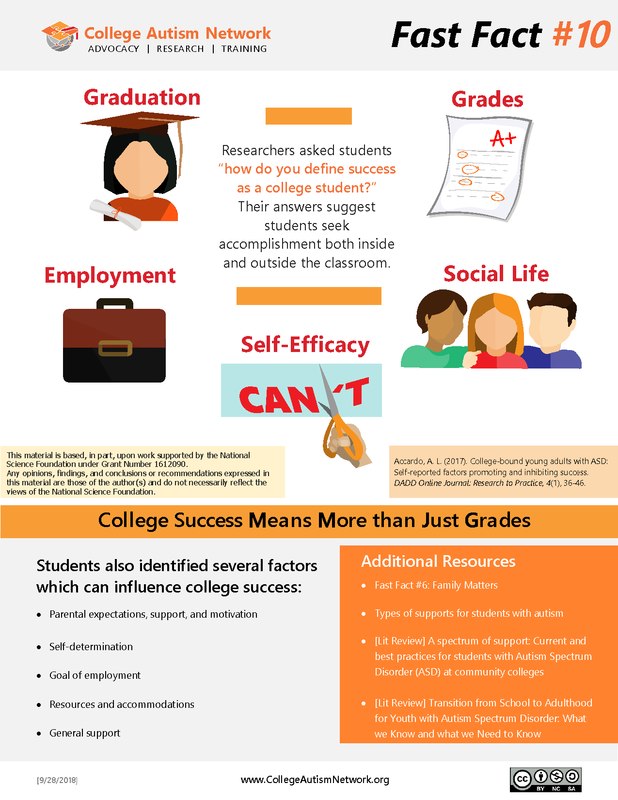 Formal accommodations may not adequately support students’ academic needs. One reason for this deficiency is that student accommodations are not always fulfilled by teachers, which can be very challenging for students. [Event] INSAR2018 – Are Autistic Students More Stigmatized Than Other Types of Neurodiverse College Students? 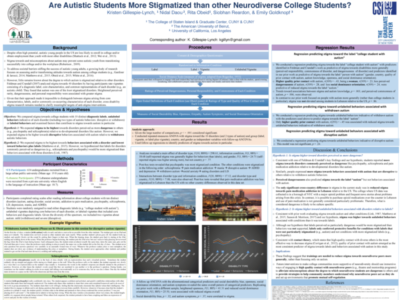 We compared stigma towards college students with different disorders and examined factors that contribute to stigma towards autism in particular. Findings suggest that autism is less stigmatized on college campuses than disorders like psychopathy and schizophrenia which may be perceived as dangerous. Indeed, stigma towards the label “autism” was associated with perceived dangerousness. Stigma was consistently related to quality of prior contact with autism, suggesting that interventions which put autistic students into high quality contact with peers are powerful tools for stigma reduction. Whenever we develop new training documents, host webinars, or offer presentations at professional conferences, we will post the associated materials as on this website (categorized as “can-training”). We’re not the only ones working to improve the experiences and outcomes for autistic students in higher education. Therefore, we offer links to other people’s training materials via posts categorized as “training-other” on this website). College Autism Spectrum: independent organization of professionals whose purpose is to assist students with autism spectrum disorders, and their families. Wrong Planet: web community designed for individuals (and parents / professionals of those) with Autism, Asperger’s Syndrome, ADHD, PDDs, and other neurological differences.